If you are in the business of offering real estate loans for the purchase of home, business or agricultural property, you need an accurate, honest assessment of how much that property is worth in order to make the most successful loan. For that, you want the best appraisal management company. 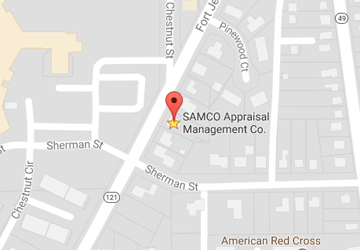 In Ohio, the appraisal management company to call is SAMCO. We have years of experience appraising homes and businesses throughout Ohio and can provide you with exactly the help you need. Lending opportunities in Ohio are stronger than ever, especially in the commercial lending business, where the Cleveland area is hiring more commercial bankers and opening new loan production offices. This means the need for quality appraisal management services in the state of Ohio is greater than ever. While lending growth has been boosted by a strong economy and a business-friendly government, it’s hard to know how long these factors will last. It’s critical to take full advantage now. If your bank or lending institution is making a lot of loans for business real estate, it’s easy to let some things fall through the cracks. Staying in compliance is harder than ever and you don’t want to make a mistake that costs you money or gets you in trouble with Federal regulators. SAMCO can help you stay on top of all your loans and make sure you get a compliant report each time. While there is a lot that goes into successfully running a community bank or local mortgage lending institution, studies show that one of the most important features of a growing and successful bank is having high-quality loan assets. That’s where SAMCO comes in. You don’t need to waste time and money finding the right appraisers for the properties involved in your loan. We do all that for you, as well as keeping loan officers away from appraisers so you stay in compliance. Our valuation products allow you to enjoy full appraisal independence. We at SAMCO can definitely help you with the growth of your commercial lending business, but we offer high-quality and reliable residential appraisals and agricultural lending solutions as well. We can customize an appraisal management program to your needs, even providing you with highly accurate custom reporting based on real-time data if you should require it. If you’re a community bank or a local lender looking to make a big splash, you need high-quality professional appraisal management services. SAMCO has an unimpeachable reputation for providing affordable, highly efficient appraisal management solutions that work. From appraisal management with a scored review to make sure you meet USPAP requirements to cost-effective and accurate evaluations and more, SAMCO can streamline and supercharge your lending process while keeping you in compliance with Federal regulations. To learn more about what we can do to enhance the growth of your Ohio lending institution, contact us today.